We have two streams of research on this topic: 1) diagnostic and 2) treatment. The diagnostic studies involve the use of Electrovestibulography (EVestG) and Virtual Reality Assessments. The treatment studies involve the application of repetitive Magnetic Stimulus (rTMS) and our specificlly designed Brain Exercises. Our Neurodiagnostic Lab and also rTMS Lab are located in Room PE-446 and PE-450, Administration Building, Riverview Health Center (1 Morley Ave). 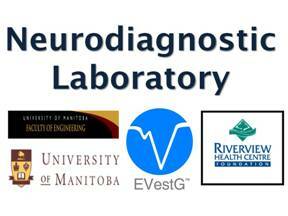 The Neurodiagnostic Lab, supported by Neural Diagnostics Canada Ltd, is equipped with EVestG system. Our virtual reality assessments are run in Engineering building, Fort Gary Campus. While the EVestG system is being used for diagnosis of depression, separation bioploar from monopolar, Parkinson and Meniere's, our main focus of its use is on the diagnosis of Meniere's (dizziness disease) as well as diagnosis and monitoring of concussion. The virtual reality assessments are merely used for detecting Alzheimer disease as the early onset. The above pin note refers to a short video clip on our Alzheimer's study. To learn more about our studies click on the links below. Here is also a recent Tedx Talk of Dr. Moussavi on Battling with Alzheimer's. The slides of the talk can be seen in this link. Also here is an interview with Alzheimer's Society of Manitoba.